How does EECP work to eliminate chest pain and angina? How is the EECP procedure carried out? What are the benefits or advantages of EECP over surgery? What is the diference between EECP and ECP? Is Heart Treatment without Surgery Really Possible? American College of Cardiology 68th Annual convocation was conducted in New Orleans USA on 18th of March 2019. Every year few selected physician from all across the world are given the Fellow of the American College of Cardiology (FACC). This fellowship is one of the most distinguished designations American college offers to its members, and it's the ultimate recognition of professional achievements. The meeting was three days affair attended by more than 5000 cardiologists worldwide. 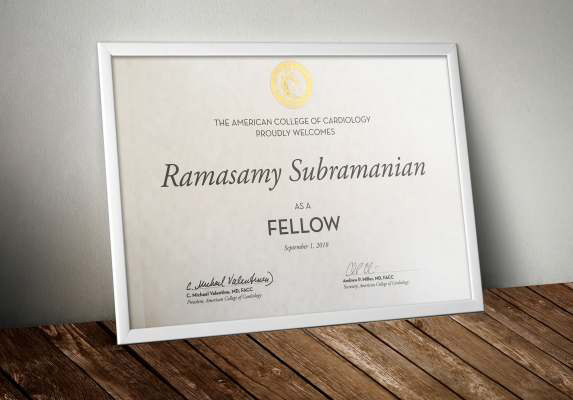 In this year convocation, Dr.S.Ramasamy a Non-Invasive cardiologist and international EECP expert were chosen among the few internationally renowned physicians and honored with the Fellow of the American College of Cardiology (FACC) award. This is a great honor and the moment to cherish for Heal your Heart EECP centers and our country. The fellowship was confined to him based on his tired-less research contribution in treating patients with coronary artery disease. His exemplary research publication in the field of angina and heart failure management through a validated Non -Invasive approach by Enhanced External Counter Pulsation treatment has finally recognized by the highest authority in the field of cardiology. Dr.S.Ramasamy research publications, review articles, original articles and contribution to cardiology textbook was reviewed and selected for this award. 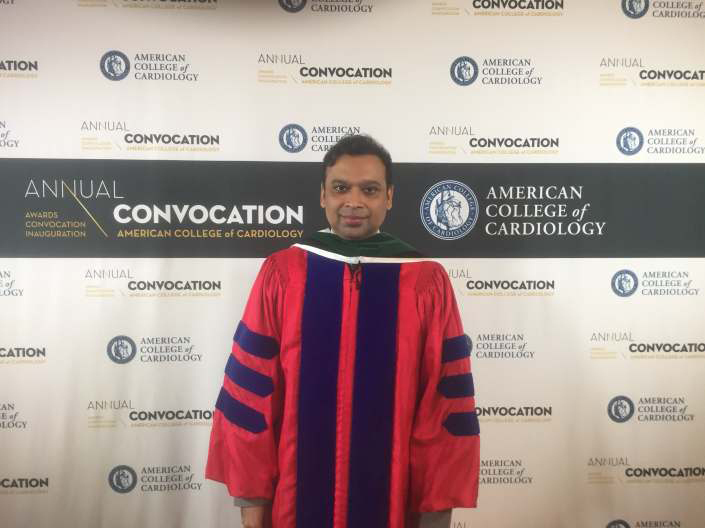 Dr.S.Ramasamy received the award on 18th March 2019 on the sixty-eighth Annual Convocation of the American College of Cardiology conducted on the Ernest N. Morial Convention Centre New Orleans, Louisiana in the Great Hall. The function was attended by the President of ACC Dr. Michael Valentine and many other cardiologists who were giants in their respective field. Dr.S.Ramasamy said Enhanced External Counter Pulsation treatment role in managing coronary artery disease from prevention to treat end-stage heart failure is been a major attraction in cardiology. This treatment will be a boon for a country like India where the cardiac disease is rampant and increasing both in the Urban and rural area. Through Heal your Heart EECP centers, world largest EECP chains we will pursue the Government of India and policymakers and insurance sector to implement EECP treatment all across India through private centers and through government medical college and primary health care center. Dr.S.Ramasamy at the convacation award ceremony in New Orlenas USA March 18th 2019. Heal Your Heart is a Franchisee Unit of Vaso-Meditech Pvt Ltd , who are the Largest Vaso-Meditech Enhanced External Counterpulsation (EECP) Non Surgical Cardiac treatment Provider in India. The Franchisee Unit offers investment, Clinical and technical support for Vaso-Meditech EECP treatment. The Experienced staffs and distinguish clinical service coupled with web based patient managemen system make Heal Your Heart as as preferred choice for Non-Invasive Cardiology. EECP THERAPY uses a proprietary technology to inflate and deflate a series of pneumatic cuffs enclosing the lower extremities of the patients. Treatment is administered on a padded table in which three sets of electronically controlled inflation and deflation valves are located.